Receive your CD and DVD duplication quote instantly online 24x7. Simply complete the form below and a quote will be emailed to you with pricing and lead-times. 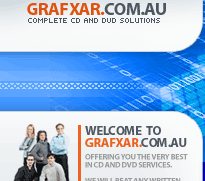 We offer fast turn around Australia wide CD and DVD duplication service. For orders over 300 units, it is generally more cost effective to use the CD/DVD Replication method of production, click here for a instant CD/DVD Replication price online. After submitting this form you will receive an email with your requested prices. © Copyright 1999 - 2016 Grafxar Multimedia, Australia's leading CD and DVD manufacturer. Supporting clients in Adelaide, Melbourne, Sydney, Brisbane, Canberra, Darwin and Perth.